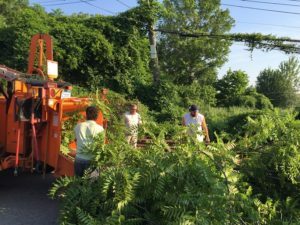 Able Tree Care provides tree removal services in the Bronx. Our Bronx tree removal service includes emergency tree removal, and full stump grinding and root grinding services. When you need a tree removed from your property in the Bronx Able Tree Care can get the job done fast, affordably, and safely. We are the top Bronx tree company providing expert tree removal services. Able Tree Care is a fully certified and insured tree service company in the Bronx and surrounding areas. Our Bronx tree company provides the following arborist services: tree removal service, tree trimming, tree pruning, tree cutting, dead tree removal, lot clearing, debris removal, stump grinding, and emergency tree removal services with affordable prices. The Bronx is home to the largest park in NYC and is filled with beautiful trees; let’s keep them healthy! For the best local tree company that you can afford, and that can help you with dangerous Bronx tree removal situations, call now. At Able Tree Care we offer exceptional prices with free estimates for all tree removal and tree cutting services. Able Tree Care has been helping residential and commercial customers with all their Bronx tree service needs with first-class workmanship. Use our affordable and professional Bronx tree service because we understand trees, and we understand the services needed when caring for a tree, or when a tree needs to be removed. When it comes to dangerous or dead tree removal services, our expert tree crews are fast acting, knowledgeable, and safe. We work with all the newest and safest equipment the industry has to offer as we are a professional Bronx tree company always up to date. Let us give you a FREE tree assessment and tree removal quote today; just give us a call now! Why Use our Bronx Tree Service? We are a certified tree removal and tree trimming service. Our professional tree crews follow the latest standards and rules set for proper tree care and tree removal. When it comes to trimming trees, our experienced climbers are “spike” free so that your trees can remain healthy with out infection, and your scenery will improve when you hire our Bronx tree company. Our Bronx tree service is ready to do your job 24/7! We are proud to have you as a client and look forward to our business with you now and in the future. Thank you for your time and have a wonderful day! We are your Bronx tree service company that will act quickly when you are in need of tree removal in the Bronx.